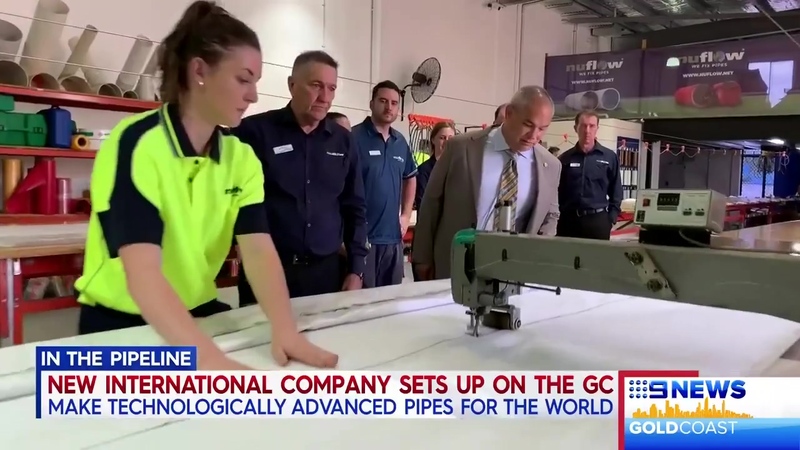 One of the legacies of the 2018 Gold Coast Commonwealth Games was to build industry and drive innovation in the city, and Nuflow Technologies was touted as a great example of just that growth and drive at the opening of their second manufacturing facility on the Gold Coast yesterday. Despite the drenching rain which had been falling for the previous 24 hours, preparations went ahead, and as the opening of the new base at Molendinar drew closer the plumbing gods of the sky decided to plug the leak and the sun crept out from behind the clouds. With City of Gold Coast Mayor, Tom Tate, members of Gold Coast Rotary and most of the city’s media in attendance, Ed Ahern, Managing Director, praised the efforts of his workforce in developing cutting-edge solutions to fix broken or leaking pipes without the need to excavate. He said the pipe repair technology they’d created together was world class and was already being used with much success by those responsible for the management and maintenance of aging underground pipe infrastructure around the world. “There’s a lot of pipe infrastructure in regional areas of many western countries that went in around the middle of last century,” he said. “Much of it was made from asbestos cement, which has a life expectancy of about 50 or 60 years. “That’s why we’re starting to see deterioration and breakdown in those stormwater and sewage drains now and an increase in the number of pipe repairs needed beneath roads and buildings. Mayor Tate, a qualified civil engineer, was notably impressed with what he saw. “I love this,” Cr Tate said. “From a council point of view, it’s great because we’ve got a lot of old pipes here and with this technology we can actually fix those pipes under the roadway without digging so there’s less disruption. “It’s more cost-effective and it’s stronger so I’d say they’re going to be doing contracts (for this type of work) not just in Australia but all over the world. “And from my perspective as Mayor, well this is what the Gold Coast is all about. “It’s innovative; and it really reflects the ‘have a go’ approach we’re encouraging on the Gold Coast, where if you have a dream, this is the place to make it a reality. “My congratulations to Ed (Ahern) and his team for having the confidence they’ve shown and we, as a council, want to show our support. Before unveiling a commemorative plaque, Ahern acknowledged that team for their contributions, and said that everyone had played their part. Planes, trains and automobiles…. and now pipes!